“Um … what are you doing?” I asked tentatively. I could see quite well what she was doing. So, why ask such a silly question? Because it was a stall-for-time kind of question. My brain was stuck on the clean up portion that would inevitably occur at the end of her creative activity, as in who’s going to clean this mess up and it better not be me? The scent from all those products was pretty strong, too. A quick flick of the switch on my range hood fan would make quick work of that scented mess! I’m going to guess that you’re with me on this one – and not just about who gets the pleasure of cleaning up! But, the thought of spreading anything that contains dubious amounts of toothpaste mixed with shaving cream and a lot of other mystery ingredients on your skin is cringe-worthy. So, as gently as I could, I explained that there’s actually an environmentally-friendly solution to obtaining hydrated and smooth-as-silk skin. She’s all about preserving the natural environment. So, I know my argument hit the bull’s eye. It took us about half an hour to gather together everything we’d need to create our homemade skin care products, including ingredients, utensils and storage containers. Stir the ingredients together, mashing all the while with a fork. Or place all ingredients into a blender and process until smooth. Add a little water if the mixture is too thick. Smooth the mixture onto your skin; leave on for 30 minutes then wash off with warm water. My very creative daughter is quickly heading toward those dreaded teenage years. Apart from the emotional ups-and-downs that define that period of childhood, there’s also another issue that tends to surface at this time – acne. Although pimples, blackheads, and all the other skin-related issues that fall under that acne umbrella are completely normal, I don’t know if there’s a teen out there who is one hundred percent fine with the phenomenon. I like to tell my daughter that everyone experiences acne at this age, and it’s just an opportunity to pamper her skin with a little extra cleaning. Stir all ingredients together until a paste is formed. Apply to the blemish. Leave on for 1 hour. Rinse off well with warm water. Re-apply as needed. Mint grows like crazy. I know because I planted some mint in my garden about ten years ago. If I don’t cut it back every once in a while, it will crowd out everything else. Luckily, mint is a wonderful addition to any garden. It adds a hit of freshness and flavor to any meal or drink. Chew a few leaves as a breath freshener, too. When the summer heat leaves us all dripping in sweat, you can pull together the following quick refresher in a matter of moments. Need to feel clean and fresh? Spray a little of this mint concoction on a cotton ball and gently dab it on your skin. Pour the water into a saucepan. Add the mint leaves. Allow the mixture to boil for 2 to 3 minutes, until fragrant. Let the mixture cool completely. Strain and store in a clean spray bottle. 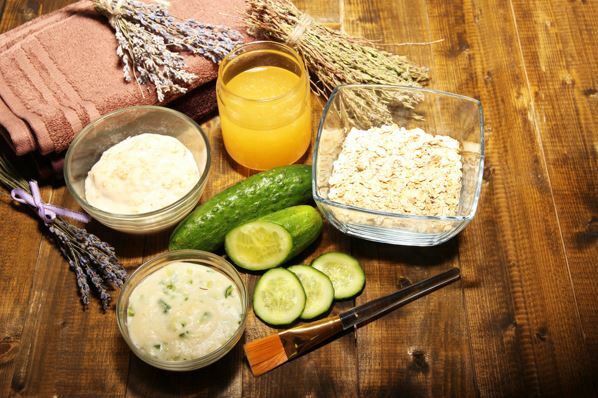 Do you have any of your own homemade skincare solutions? Share them here! About the author: Range Hoods Inc is a premium retailer for all things kitchen-related. We carry trusted brands with a focus on customer satisfaction. With a decade of industry experience, Range hoods Inc has something for everyone. For more information, visit Range Hoods today!